Historically, Anegada iguanas were found in xeric (dry), limestone habitats across the Puerto Rican Bank, which encompasses Puerto Rico, its satellite islands, the US Virgin Islands, and the British Virgin Islands. They became restricted to Anegada, the largest limestone island on the Bank, in the late Pleistocene when rising sea levels inundated the region, forming the present day islands, and the climate became wetter. Due to predation of juveniles by introduced feral cats, natural recruitment of iguanas on Anegada had been all but eliminated by the 1990s, resulting in a rapidly declining population of aging adults. Together with our partners, our Population Sustainability researchers have assisted with headstarting iguanas on Anegada since 1998 to bolster the wild population. Every summer iguana nests are located and protected by a team from the Fort Worth Zoo and British Virgin Islands National Parks Trust, and each fall the resulting hatchlings are collected and transferred to a facility on the island, where they are raised until large enough to survive potential predation by feral cats. Since 2003, nearly 190 head-started iguanas have been released on Anegada, with an 80-percent survival rate, resulting in a near doubling of the wild population. Others have established several introduced populations of Anegada iguanas on private islands in the British Virgin Islands. While these populations provide an important hedge against extinction, they are all derived from only eight adults removed from Anegada in the mid 1980’s, raising concerns of inbreeding. We are currently analyzing the population genetics of the introduced populations and investigating options for their genetic augmentation. In partnership with the British Virgin Island National Parks Trust, we are exploring establishing a genetically robust population of iguanas on a protected public island, and reintroducing the species to protected offshore cays of Puerto Rico in collaboration with Puerto Rican and US government agencies. Working with our partners, we helped to establish a long-term population study of marked iguanas on Anegada in 1998, allowing their movements, reproduction, growth, survival, and numbers to be monitored. In addition to these in-country conservation efforts, we maintain a colony of Anegada iguanas at the Griffin Reptile Conservation Center. We breed these animals in cooperation with other US zoos as a hedge against extinction in the wild. 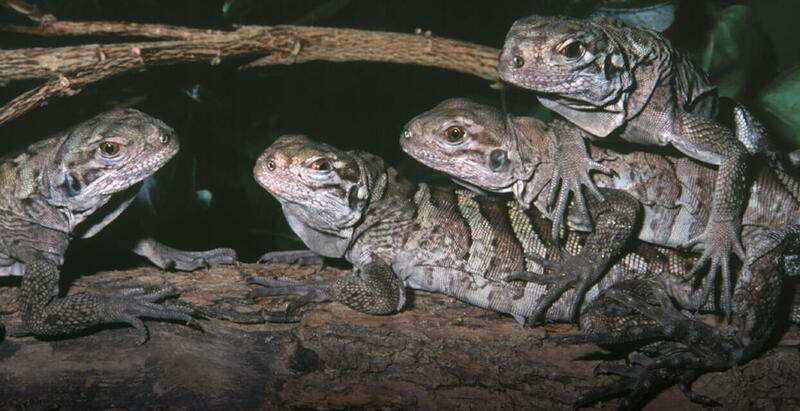 For the past 25 years, the Institute for Conservation Research at the San Diego Zoo Safari Park has maintained an off-site breeding and research center for critically endangered rock iguanas.